The Legend is Born: Ip Man movie is a big winner! You get to watch a living Wing Chun legend (Ip Chun, Ip Man's surviving son) on screen — in a fight scene! ...so I was expecting the worse. After searching high and low for a copy of “Legend”… Ip Man pulled through. I really liked this version. The main reason some fans didn’t like The Legend is Born: Ip Man was because it is NOT affiliated to the first two movies, even though they used some of the same cast in different roles; specifically Sammo Hung. This confused and frustrated many people. 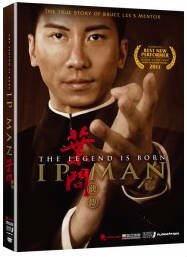 Then there was the problem that some DVD jackets had "Ip Man 3" written on them. I'm guessing those were bootlegs(?). If you watch the movie on its own merits, like I did, you'll enjoy it very much. It also helps that this version is a pre-qual to the first two Ip Man movies. So the break from Donnie Yen isn't so hard to take. In “Legend,” Ip Man is young. The movie starts with him learning Wing Chun as a child, and then through his high school and university years. I won’t give away the plot - you’ll have to watch it. A living legend fights in the film! In most kung fu movies, many of the real martial artists are on set as trainers and coaches. One big plus here is Ip Chun, Ip Man’s surviving son, plays a big part in the movie and is in fight scenes too! ... You get to watch a real living legend on screen. How they demonstrate this in the movie also rubbed many Wing Chun practitioners the wrong way. Again I won’t give away the details. But in many of the fight scenes they test the boundaries of Wing Chun principles. Honestly, it made me feel a little uncomfortable.